At Facebook there are many groups where self-publishing is discussed. At several of them members upload in-process covers of their books and ask for critiques. As you might expect, nearly all such requests concern author-designed covers. Some are well done, a few are of professional quality, but most contain basic mistakes that the author-designers just don't catch. For months I've offered critiques at these groups, and the critiques have been well received. I go into more detail than most commenters, most of whom say little more than they like or don't like a proposed cover. I explain what works and what doesn't work in terms of graphics, typography, and wording. Many authors have said they have found my remarks helpful. 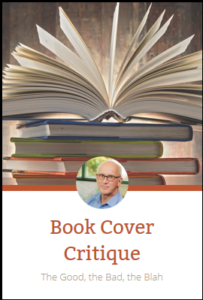 And I've enjoyed making the critiques—enjoyed it enough that I've launched a separate website called Book Cover Critique. Its tagline is "The Good, the Bad, the Blah." Take a look. Even if you aren't an author, you probably read ebooks and might find my critiques informative and even entertaining.